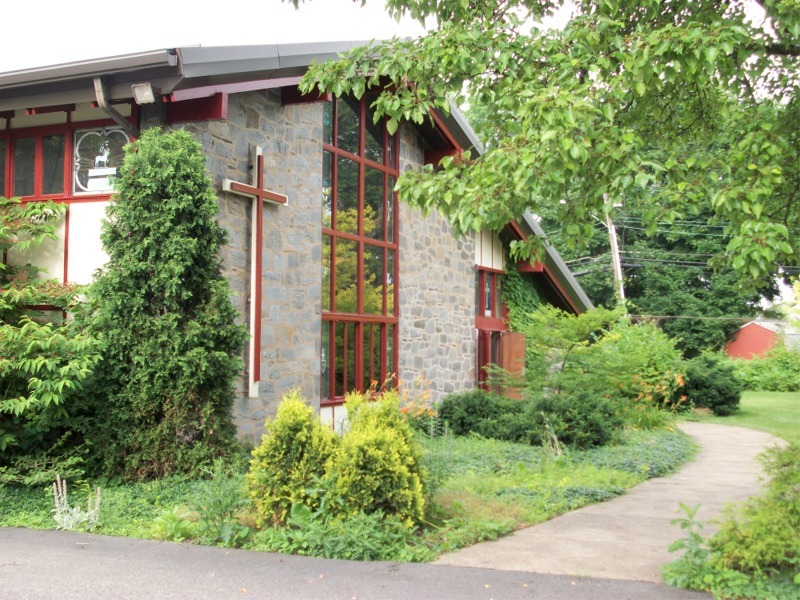 As I explained in “Third Congregation Settles with Episcopal Diocese,” St. James’, Penn Hills, is beginning the next phase of its life as an Episcopal parish. Representatives of the “Anglican” congregation turned over the keys to the building last week, and the first Episcopal service at the church in several years was scheduled for today at 9 AM. Suppressing guilt for abandoning my own parish’s choir on the Fourth of July weekend, I decided to attend church at St. James’ this morning. 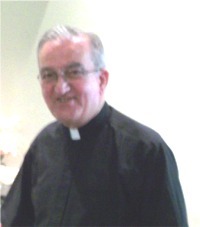 I knew that an old mailing list had been used to contact those who had attended St. James’ before the October 2008 split in the diocese, but it seemed unlikely that many people would show up for the service. 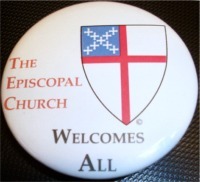 I thought that some people needed to attend to show the flag, so I put on my “The Episcopal Church Welcomes All” button and headed off on the half hour trip to Penn Hills. 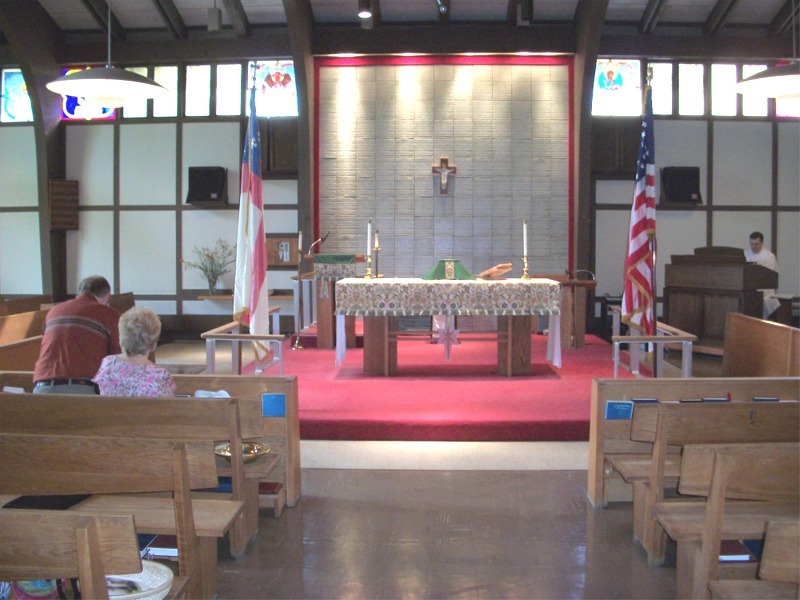 I had not been to St. James’ in years, and I had never been inside the actual worship space. In fact, I remembered little about the church and feared a rather dreary service with a tiny congregation and no music. The church is on a hill and is hidden by shrubbery and buildings. I drove up the hill and parked in the parking lot. I got out of the car and proceeded to the church. I was hardly in the door when Gwen Santiago, wife of Priest-Developer Vicente Santiago ran up to me and gave me a hug. I had not announced that I was coming. Gwen and Vicente (see picture at left) were at St. James’ for much of Saturday, cleaning and organizing the church for today’s service. When I arrived, the place looked pretty much like any other Episcopal Church. Construction on the building began in 1955, when the parish was already more than a century old. The building is decidedly modern and neither lavish nor spartan. I was surprised (and delighted) to see that we would have an organist for today. There was a minimalist service leaflet, which I suspect was composed and duplicated Saturday night. I was happy to see an Episcopal Church flag in evidence, though it was wrinkled and faded. Apparently, it had been in storage for a few years. Vicente was celebrant and preacher, and Gwen performed all the other duties, except for reading the lessons and leading Prayers of the People. 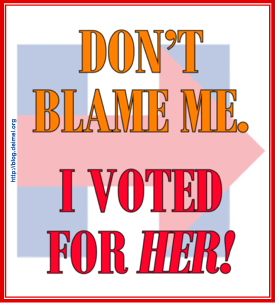 For these, she recruited volunteers. I read one of Paul’s tongue-twister passages from Romans, which was difficult without preparation. (Sample: For I do not do what I want, but I do the very thing I hate. Now if I do what I do not want, I agree that the law is good. But in fact it is no longer I that do it, but sin that dwells within me.) Music was largely patriotic, which was fine with me for a July 3 Sunday. We sang, among other things, “My country, ’tis of thee” (#717), “God of our fathers” (#718), and “O beautiful for spacious skies” (#719). The service ran relatively smoothly under the circumstances, and I felt very glad to be a part of it. The congregation numbered about 10, and included no one from the recently relocated congregation. Some people were there for the same reason I was, but there were others. For example, I met a former senior warden and his wife who had left St. James’ before the congregation decided to follow Bob Duncan out of The Episcopal Church. They have not been attending church at all, but they seemed ready to return to their former parish. I was talking to the organist after the service when a woman walked in asking the time of the service. The newspaper article she read did not give a service time, and she was surprised to learn the service was over. We made her feel welcome, however, and invited her to have refreshments with the rest of us. 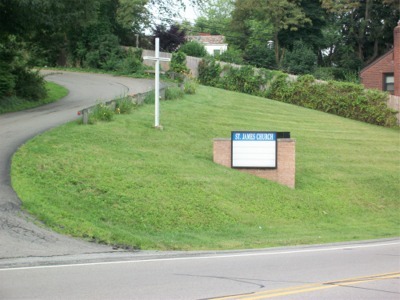 As it happens, she is a Roman Catholic living in Penn Hills and looking for a more welcoming place to worship than she experienced in her own church. I think she left a recipient of warm hospitality and a few mini-lectures on The Episcopal Church. I suspect she will be back. All in all, my visit to St. James’, Penn Hills, was an uplifting experience. Rebuilding a parish that has undergone so much trauma will be difficult, but it can be exciting as well. Vicente and Gwen seem determined to make it work. God willing, St. James’ Episcopal Church will once again become a major parish of the Episcopal Diocese of Pittsburgh. Thanks for this report, Lionel. As I understand the history, St. James Episcopal Church was "planted" (they didn't use that kind of language) in the 19th century by St. Andrew's--which was then located downtown, on the present site of the CAPA high school. The first priest of St. James Church had been an assistant at St. Andrew's, and most of the individuals on the original vestry had been members of St. Andrew's. The first location of St. James Church was in what we would call today the Strip District/Lawrenceville neighborhood. In the early 20th century a new church was built in the then-fashionable North Point Breeze/Homewood neighborhood, with the same architects, Carpenter and Crocker, who had recently designed the new St. Andrew's Church in Highland Park. In the early 1950's the building was sold/given (don't know) to Holy Cross Church, which had been in the Hill District, and with the guidance of Bishop Thomas the property in the Penn Hills was purchased and construction begun. The present facility was originally to be the "parish hall," and a separate Church was to be constructed, but I guess they ran out of money. There is a small but nice rectory at the back of the property. Thanks for the history lesson. I think I had read about the Holy Cross/St. James’ connection when reading about Holy Cross, but I had long since forgotten about it. Apparently, what is now the church was to become a basketball court when the proposed detached church was built. For the foreseeable future, the current worship space should be quite large enough. Lionel, the sign out front is broken. Because people could get inside the sign, most of the letters were taken over time and there are not enough sign letters to even post the word "Episcopal" -- much less the time of service. Letters are now on order, and I will be getting someone in to fix the Covers on the sign. Thanks Lionel for your attendance and your post. 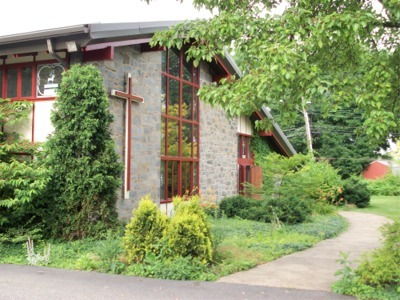 Under the circumstances and where this is the first physical plant to actually be returned (if my memory is correct), I believe that everyone in the Pittsburgh Episcopal Diocese would like to see the St. James parish flourish and serve as a shining example of the middle way. The recent adoption of gay marriage in New York state to my mind presented another sharp contrast between the open hearts and open minds professed by Episcopalians, and the Pharisaic intolerance of Duncanism. Welcome home St. James. May you grow and prosper! Thanks for the report Lionel. (I am the organist at St. Andrew's) Perhaps we could send some of our music scholars from time to time to help with the music. I think that would be great. 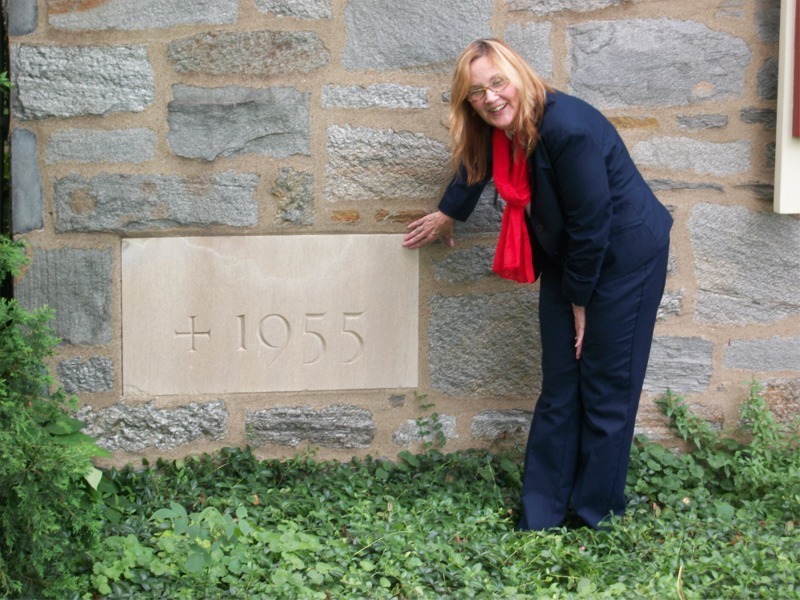 The board of Progressive Episcopalians of Pittsburgh is also thinking about what PEP can do.